Extremely strong, stitchbonded, polyester reinforcing fabric that is compatible with all Andek liquid-applied coatings. Possesses exceptional tensile, tear and elongation properties. 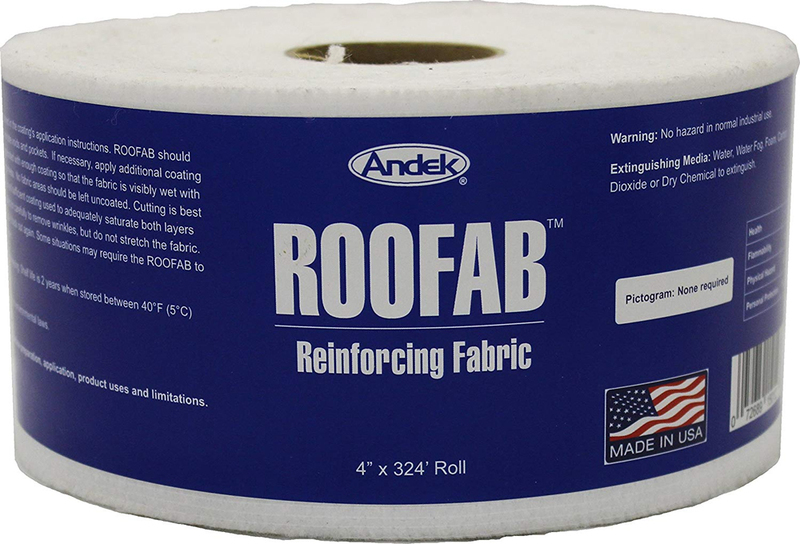 ROOFAB is an extremely strong, stitchbonded, polyester reinforcing fabric that is compatible with all Andek liquid-applied coatings. It is embedded into coatings during application to boost cured membrane strength and absorb stress. ROOFAB possesses exceptional tensile, tear and elongation properties. When working with ROOFAB, the shiny side should be facing upwards and the flat, more absorbent side, facing downward against the substrate. Prepare the substrate and apply a coat of the liquid roof coating as outlined in the coating’s application instructions. ROOFAB should be unrolled and thoroughly worked into the newly applied wet coating in sufficient thickness to thoroughly saturate from below. Be sure to eliminate voids and pockets. Brush thoroughly over the fabric to squeeze the coating directly up into the ROOFAB to thoroughly saturate the fabric. ROOFAB needs to be sealed with enough coating so that the fabric is visibly wet with coating on both its top and bottom sides. This insures both proper bond and watertightness. No fabric areas should be left uncoated. Cutting ROOFAB is best accomplished with scissors. Full width rolls should be overlapped a minimum of 2 inches and sufficient coating used to adequately saturate both layers of ROOFAB and avoid fishmouths. 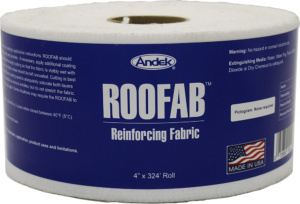 Saturated ROOFAB with wrinkles should be pulled on carefully to remove wrinkles, but do not stretch the fabric. When laying into corners, ROOFAB must be cut to fit; otherwise, its elasticity will pull it back out again. 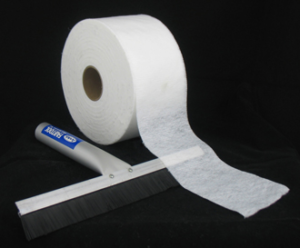 Some situations may require the ROOFAB to be anchored with staples to the substrate while the coating cures to prevent slippage. Newly applied and coated ROOFAB should not be walked on until it is thoroughly dry. Do not allow any uncoated areas or sections of ROOFAB to remain exposed. Any damaged areas can be repaired with ROOFAB to the necessary size and shape to fit the repair. Next, apply fresh coating (or primer and coating) to the repair area. Finally, embed the ROOFAB and immediately topcoat the entire area with coating. Allow the repair to fully cure.